All L21+ L459+ Z245+ and/or Z260+ people should join. 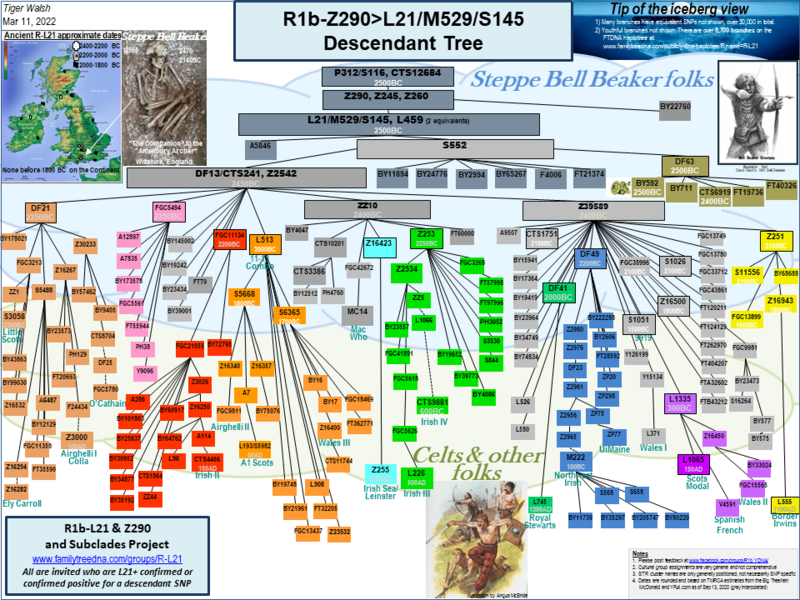 L21 is the most frequent Y haplogroup of the British Isles and includes subclades such as DF13, Z2542, CTS4466, DF21, DF49, FGC5494, L1065, L226, L513, M222, S1026, S1051, Z251, Z253, Z255, etc. Other names for L21 are M529 and S145. This is a public project. When you join you're making surname, ancestor and DNA related results public, from which they can never be fully retracted. Do not join if you don't want to share publicly. We do not publish your full name or contact info and try to respect privacy. Please consider BIG Y or SNP Packs and 111 STRs. Read About/Background Welcome project page and get help as needed.